The 4th October saw an unprecented day of action in the history of the IWW in the UK and Ireland. Never before had the union seen action up on this scale with members of the IWW Couriers Network uniting with workers in other areas of the fast food industry to bring voice to their collective demands for better pay and conditions from the companies they work for. Through the hard work and dedication of its members, of the IWW Couriers Network managed to organise a national strike in under three weeks!! This action signals the first of what will no doubt be many by the Network and is an outward sign of the growing strength, drive and determination its members have to bring about real change in the industry! Below are a summary of some of the key actions from around the UK and demonstrates the confidence that the couriers network is giving to workers on the ground, building their network, on their own terms. This day was only just the start, and the IWW Couriers Network grows in strength from day to day, with the focus now on consolidating into the new locations that have joined the network as part of this action – notably London and Newcastle. Deliveroo and Uber better watch out – the IWW is on the march!! In Lewisham and Greenwich, in South London, riders took part in a flying picket for 2 and a half hours through Cutty Sark, Lewisham, around the O2 arena, Blackheath and New Cross. No Deliveroo riders were picking up orders, forcing busy restaurants to cancel lots of orders. Some orders were waiting for hours and Deliveroo were forced to introduce a £2 bonus per delivery in order to break the strike. In Erith, South-east London, riders enforced a strong picket into the night outside McDonalds. Their numbers swelled quickly as riders who came to pick up from McDonalds were persuaded not to and join the picket instead. In Surbiton, Shepherds Bush and Hammersmith riders forced McDonalds to go totally offline by turning off app on their end, preventing customers from being even being able to order. The picket in North Finchley, in North London, two weeks earlier had erupted in violence as strikers tried to prevent others from working. This time most of the fifty drivers simply stayed home, not working but also not picketing. The remaining dozen logged off and picketed McDonalds, with only two continuing to take orders by car. 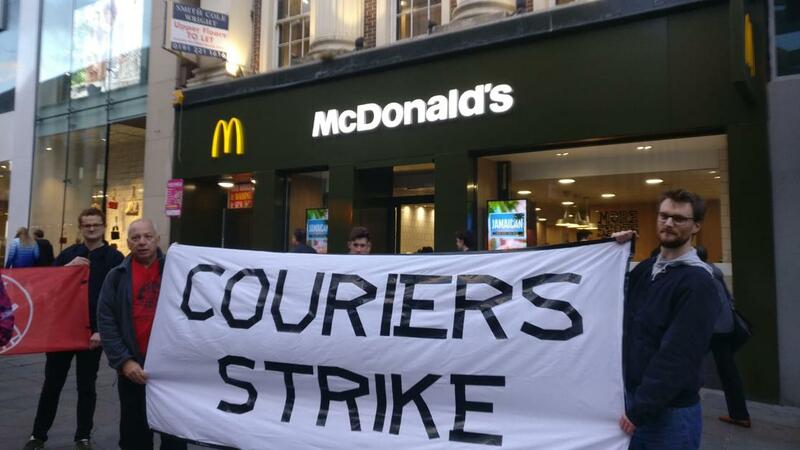 Although there was no blockade or flying picket, the lack of deliveries was enough to piss of the McDonald’s manager, who called the police on IWW activists and threatened to “destroy” their leaflets. Riders were also on strike across South-west London. In Oldsfield, there were clashes between striking riders and scabs attempting to pick up food from McDonalds. At other McDonalds in the South-west the majority of drivers were on strike, however they didn’t picket, so scabs went unchallenged. In Putney, Deliveroo were also forced to pay drivers £1 extra per drop to incentivise riders to cross the picket line. The drivers held strong and no food was collected. 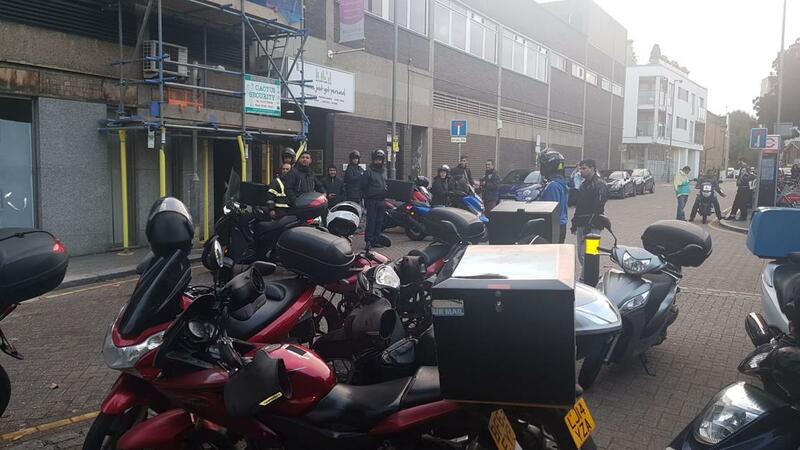 In East London, at the Bethnal Green McDonalds many riders had participated in the strike the week before and were extremely angry at UberEats for ignoring them. IWW activists and riders also got a chance to speak to riders who didn’t know about the strike and who joined the picket. At Holborn McDonalds, in central London, riders, IWW members and students held a firm picket line that was not crossed. Students came out in force from nearby universities to support strikers, much to the annoyance of McDonald’s management. UberEats couriers approached the Newcastle IWW branch days before the strike wanting to take action. Riders had a real appetite for action but needed support. The strike began at Northumberland Street McDonald’s where riders and supporters gathered with banners and signs. The picket moved to the nearby Grainger Street McDonald’s where even more riders joined the demonstration. There was huge support from passersby who stopped and offered their solidarity to the striking riders. They made the same demands to both UberEats and Deliveroo: £5 a drop, 17p per minute waiting time in restaurants (equivalent to £10 per hour), additional app transparency and no victimisation. The strike was one of the biggest food platform mobilisations ever seen outside London. When Deliveroo sent down a ‘rider engagement team’ a few days later, the riders formally presented their demands. Future action is planned unless their demands are met in full. 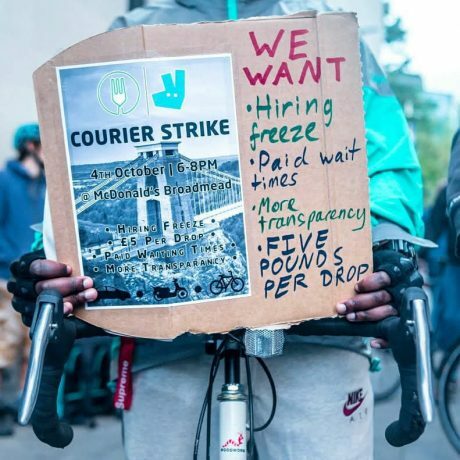 In Cardiff, the IWW Couriers Network organised the strike of UberEats riders. It was a solid strike with very few scabbing riders. Any wannabe scabs may have been frustrated because activists succeeded in persuading a number of restaurants to switch off their apps for the duration of the strike, including the 2 key McDonalds in the city centre. 40 UberEats couriers joined a lively demonstration of over 100 people supporting the Fast Food Strike in Cardiff City Centre. The crowd gathered outside McDonalds before marching on to the other McDonalds and finally onto TGI Fridays. The rally was addressed by a number of riders who gave their personal testimonies and described life on £3-4 an hour. 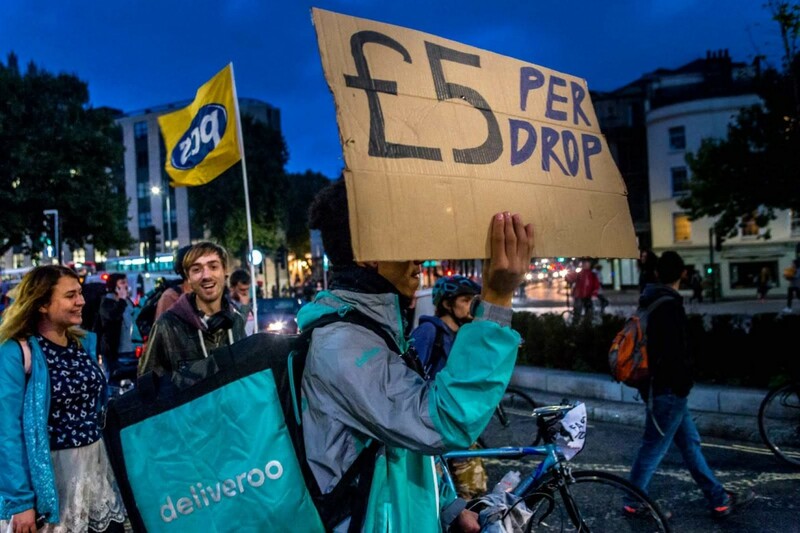 Riders then delivered their demands for £5 a drop and £1 per mile to UberEats. Other unions came out in force, with UCU, PCS, Unite, Cardiff Trades Council and the Labour Party supporting striking riders. In Scotland, the strike action was strong. In Glasgow, the IWW Couriers Network held two demonstrations to coincide with peak times, each drawing big crowds of not just riders but supporters too. The strike had a huge impact on Glasgow City Centre and halted the ability of the McDonalds to take orders. Riders were building off the back of their last strike on the 10th of September and they seem to be getting stronger and stronger. Riders in Edinburgh struck too. They picketed the main McDonalds on Princes Street, with riders handing out leaflets to passers by and other riders.